Our exclusive Elfa Kitchen Cart is a versatile workstation and storage center. Available only at The Container Store, it features a Butcher Block Top, two 1-Runner Mesh Drawers, three 2-Runner Mesh Drawers, a 32-Hook Rack and Casters. The fine weave of the mesh prevents small items from falling through. We offer a variety of Drawer Accessories that you can add to customize your solution. Elfa is an entirely customizable system - if this isn't exactly the solution you're looking for, try our Elfa Drawer Planner. Platinum Elfa Mesh Kitchen Cart is rated 4.6 out of 5 by 14. Rated 1 out of 5 by ToobusyforDIY from No instructions So, no instructions and the videos are specific to a task not the cart itself. I watched a few but did not find any task that applied to the cart. A lot of pieces that look alike. For 250$...they cld throw in some instructions or some type of overview. I’ve ordered totally simple furniture and instructions came—nbd! You wld have to be a DIYer to be happy w this. Wld not purchase again, a hassle. Rated 5 out of 5 by Smallkitchen440 from Great kitchen storage Love this shelf unit, good height and great countertop. Very nice looking in the white color. Rated 5 out of 5 by Marco1 from White Mesh Kitchen Cart Well made product with perfect utility for my small galley kitchen. This product offers portability, carrying capacity and it looks quite at home in my kitchen! The oak cutting board is a breeze to maintain. I made a smart, well-considered purchase. I'll happily recommend Elfa products to friends. Rated 5 out of 5 by mountains4me from LOVE this thing! Purchased this MINUS the butcher block top & hooks 3 years ago, intending to use it in my laundry room. However, I ended up actually using it in my bathroom! In fact, when we built our new house, I had them specifically build a place into my lower bathroom cabinets to roll it into! I have a 1-runner mesh drawer on top, with a plastic organization insert (which is available at The Container Store). It keeps all kinds of things organized & separated, like eyeglass cleaner, eyeglasses, deodorant, ponytail bands, etc. The insert is easily removable when it needs cleaning (just wash it out in the sink & pop it back in). I also have 2 of the 3-runner mesh drawers in my unit, which I use as laundry baskets...when I do laundry I just slide the appropriate drawer out & take off to the laundry room with it! I've found that the 3-runner mesh drawers hold exactly 1 regular-sized load of laundry, so convenient! I LOVE, LOVE, LOVE having this in my bathroom...no more dirty clothes thrown on the floor! When I need a space to sit while applying makeup, I simply roll the entire unit out from under the cabinet & sit on a stool right there in front of the mirror. It's GREAT! This product is well worth the money...very sturdy & well made, & customizable as to what size drawers you want or need. The mesh that the drawers are made of is very sturdy. Besides the organization insert that fits the 1-runner drawer, there are plain drawer liners available to fit each size drawer. I would love to have 1 of these in just about every room of my house, even in the garage! 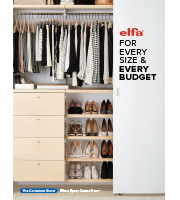 When The Container Store has their annual Elfa sale, the price isn't bad either. If you're considering this product, go ahead & get it...you'll love it! Rated 5 out of 5 by DawnNYC from Just What i Needed! I have been looking for a kitchen cart to give me a little extra counter space, but most were too big for the space I have in my kitchen. the Elfa cart is PERFECT! Such a great price and only took about 10 minutes to put together. With 3 deep baskets and 2 shallow ones, I've also gained a lot of storage space. I highly recommend! Rated 4 out of 5 by parsley from could have used assembly instructions I think the cart will meet my needs, but I was disappointed when I discovered that the stops for the drawers should have been placed before assembly of the frame completed. The unit came with no instructions so I just went ahead in a way that looked right. That turned out to be wrong since once the frame was assembled the small plastic stops could not be placed at all levels. This means that 2 of the drawers slide freely in both directions; not a complete failing, but not optimal. With instructions this could have been avoided. Rated 5 out of 5 by haroldnoir from Attractive & Fits in a Small Space I love the look of the look of the platinum finish and that it fits in a narrow space, as I just moved into a studio apartment, Also, it was easy to put together even for a petite person like me. Rated 5 out of 5 by Nanajana from Elegant space with ease of use = A+ Wooden top holds coffee maker and electric kettle leaving plenty of space for pouring coffee or tea. Side basket holds sugar, filters, stir sticks, and coasters. Drawers hold mugs, coffees, teas, tea towels, and desert plates. Wire mesh design cart is easy to clean, has a light feeling in the room while holding quite a lot of useful stuff well. Rated 5 out of 5 by Anonymous from Perfect addition when you have no counter space I've had this product for a few years and in that time have switched what i use it for. At first I had all kitchen implements and small appliances in it but recently switched it to my canned good storage on the bottom. It works great! I don't often use the top for actual chopping but only because i have another cutting board that i use instead. The platinum mesh looks great and will also blend in with my new stainless steel kitchen! Rated 5 out of 5 by Maggie from I wait to buy ANY elfa product on sale! The elfa products that I have purchased are the best purchase anyone can make! They are built for a family of children who do not know the meaning of gentle and are always in a rush. The baskets are huge and hold everything - anyone who loves to be organized has to experience owning elfa products! Nicole, It comes in several packages, I think 3 or 4, none of which are particularly heavy. I would guess no more than 5-7 pounds per package, some closer to 3 pounds. No, these wheels do not lock in place. What are the overall dimensions of this cart and the width and depth of each drawer? The overall dimensions (19&quot; width x 23&quot; deep x 37-1/2&quot; high) of our elfa Mesh Kitchen Cart can be found just to the right of the copy block describing the product. I am looking for a cart to store appliances including a kitchen aid mixer and a vitamix. Can this cart accommodate that? Thank you. The top butcher board surface, elfa Drawer Frame and elfa Casters of our elfa Mesh Kitchen Cart can support up to 99 pounds of evenly distributed weight. Can the pins be put in after the cart is assembled? I wasn't given assembly instructions and put it together without inserting the pins. There are two drawers that I can't fit the pin. How can I get the cart apart to insert the pins? To insert the elfa Drawer Back Stop Pins in the top runner, it will be necessary to remove the Butcher Block Top and the L-shaped crossbars. Gently tap up on the L-shaped crossbars with a mallet to prevent damage. Once the crossbars are removed, the pins can be easily inserted and the cart reassembled. A link to assembly instructions for elfa can be found at the end of the product copy on this page. I want to use this for a microwave oven or small appliance that weights 45lbs. The top of our elfa Mesh Kitchen Cart can support up to 99 pounds of evenly distributed, static weight. How do I get directions for assembly? I am trying to assemble the kitchen cart. The directions available are incomplete. Directions to attach the wire tie and belt hook are not included for example. Our Elfa Casters do not lock.